Cauliflower is that’s rich in nutrients and has many health benefits but it’s one of those vegetables that many people don’t like very much. Our classic roasted cauliflower recipes breaks through the food prejudices and presents a lovely and tasty way that anyone would love. The combination of the Pecorino Romano cheese and olive oil create a delightfully savory dish. 1. Break apart and cut the cauliflower into 1-2 inch pieces (flowerettes) and toss with the ingredients (olive oil, Pecorino Romano cheese, garlic powder optional dried shallots, optional Peperoncino Fiocchi (hot pepper flakes), salt and pepper. 2. Preheat oven to 350F. 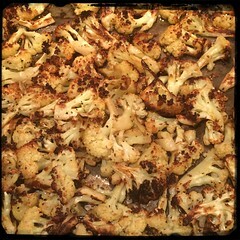 Use a shallow baking pan and cook cauliflower (350F) for about 30-45 minutes, mixing occasionally. 3. For the final stage, set the oven to broil and finish roasting the cauliflower (high heat) until edges begin to brown and become crispy (mixing frequently).